We Provide Customized Royalty Rate Studies Tailored to the Exact Needs of Our Clients. You have valuable intellectual property. It deserves a comprehensive royalty rate analysis. Clients in the midst of license negotiations rely on us for royalty rate data they can use as indications of appropriate royalty rates for their particular licensing deal. 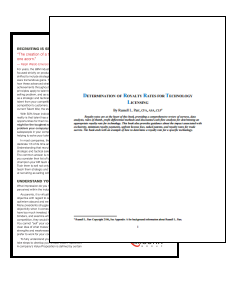 In addition to our royalty rate resource books providing compensation terms for a variety of technology, trademarks and copyright license agreements, we also provide customized royalty rate studies tailored to the exact needs of our clients. Customized royalty rate studies start with analysis of our data bases and are expanded to other data bases to which we have access. Then, financial models are created to also provide independent support for the royalty rates discovered in the data bases. Our royalty rate studies are extremely comprehensive. 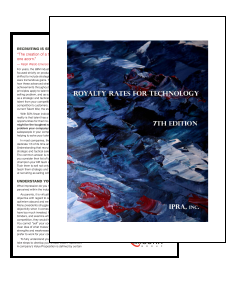 Each industry has a royalty rate “average” that some associate with it. Indiscriminant application of such averages is dangerous. An average is a calculation based on observations consisting of sometimes very high and very low royalty rates. A specific intellectual property might only be worthy of a low rate or its characteristics, such as stage of development, might make it worthy of a very high royalty rate. The correct royalty rate for your specific intellectual property mightactually be the industry average but only a comprehensive analysis can provide the confidence needed to move forward with a licensing deal.